We are covering three new cards: a neutral Legendary minion, as well as a Priest Common minion and spell. Well, it wouldn't be a proper Rumble without Da Undatakah! This incredibly flavoured card is also quite interesting. Entire decks can be built around it and it can fit perfectly into already existing archetypes like Kathrena Hunter, Taunt Druid and perhaps Mecha'thun decks. 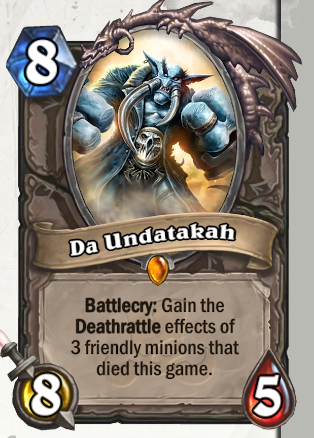 And let's not talk about how insane Da Undatakah is going to be in Wild. Regenerate is nothing special, although 0 mana spells should never be underestimated. It's a good card if Lyra the Sunshard generates it, but including it in your own deck is a different conversation. It's also notable that this card can go face with Auchenai Soulpriest, although Priest has definitely better ways to hurt the opponent's face with spells. Sand Drudge is an interesting addition to the Priest's toolkit. Token generators are usually encountered (and are more effective) in other classes. Both Sand Drudge and Regenerate could work well in a Miracle Priest deck along with the Dragon Soul legendary weapon. However, I feel that Sand Drudge has anti-synergy with Priest's most powerful cards - and even some cards revealed from Rastakhan's Rumble - since the class is mostly about putting big threats on the board and resurrecting or copying them (or just OTK combos). The 1/1 Taunt tokens are definitely annoying for the opponent, but they can prove useless for the player himself/herself. Does it work well with carnivorous cube though? Wouldn’t it just get a do-nothing deathrattle from them that hasn’t been set by the cube battlecry (like when you res/recruit a cube)? Auchenai+regenerate on enemy minion isn’t too shoddy a tempo turn. I guess I got confused by Dane - a professional player - mentioning in the reveal video that it works with Cube. After doing some research on the Internet, it looks that indeed nothing happens. And by the way, if you don't like the reveals, you can do them on your own if you feel that they are mistaken. I didn't see you weighing in on other threads saying what exactly is wrong with them (your explanation isn't very detailed here either). It's a bit of hit and miss if you can't actually see the cards ingame, but in previous expansions there hasn't been any overestimation or underestimation. Personally, as a casual player, I just do some research online before writing these articles, see the general community feel of these cards so I guess the whole community "isn't thinking too hard ahead anymore". Dont get me wrong Zadina. I do appreciate all the work you guys are doing here. However, compared to last few expansions some of your "prediction" seems rushed this time around. I apologize for coming off as a bit of a *filtered*, I didn't mean to offend anyone personally! Rushed how? Posting them 15 minutes after all the other sites because I actually care about writing a few lines about each card is rushed? Or posting them hours after they were revealed because I also have a real life? Or are you calling Stan's articles rushed (he just posts the cards), when he assists me even though he's not even playing Hearthstone? I would really be interested to see some detailed examples. Because, don't get me wrong (as you said), I might come off as offended but I am not. I won't tolerate though non-existant excuses and generic arguments. It’s just a starting point for discussion really. At the end of the day without seeing the full set first a lot of it is guesswork anyway, and even after full sets are out, even pros still can be wildly wrong on assessing card strengths. And it’s just Zadina alone this time, in previous recent expansions Aleco was around to do reviews too. I agree. Its hard to evaluate cards on their own. Especially in an expansion that is so much based on card-interactions. The only nitpick I got is, that "weak to silence" is not a real downside...every card can be destroyed or countered by an appropriate effect. And all of this without any need of direct card interactions. You can just play your Deathrattlers like always, they die, you play Mr. Troll-Undertaker -> value! So yeah, if you tend to play any deck with Deathrattle-minions, this is - in my eyes - the Zilliax of this set. The only nitpick I got is, that "weak to silence" is not a real downside...every card can be destroyed or countered by an appropriate effect. True, but I think it can still be a valid thing to say. All deathrattle minions are “weak to silence” but to varying extents (e.g. Mechano-Egg is much weaker to silence than Highmane). Also relevant is how much protection the rest of your deck provides to silence. A deathrattle deck generally has so many silence targets eventually the enemy will run out of silence, whereas something like the new rogue 5 mana 2/2 that gains the stats of a minion in your deck would be particularly weak to silence if played in a non-deathrattle themed deck. All weapons are weak to weapon removal, but how game changing it is varies from weapon to weapon. Okay, you are absolutely right. Thats a very fair and reasonable way to handle this.